It is hard to imagine that fifty-two years have passed since a tired working woman refused to stand up and give her seat to a white man. As I write this, Mrs. Parks is being honored in the place she chose to call home, Detroit, Michigan at the Wayne State University Law Library. When I was of elementary school age we never heard about black people doing anything positive, except for Booker T. Washington or George Washington Carver and the peanut. There was never any mention of people like Charles Drew, Lewis Latimer, or Rosa Parks. In history (his story) class, we were told we had been slaves until President Lincoln freed us. In other words, we never accomplished or contributed much of anything to western civilization worth mentioning. We should have been taught about the struggle and how we have overcome unsurmountable obstacles and persevered. 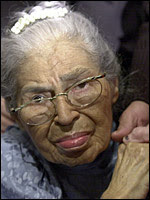 In the movie "Barbershop", Cedric The Entertainer mentioned the fact that Rosa Park's had refused to stand up because she was tired. Sometimes that is what it takes to make a difference, average, everyday people who sick an tired of being sick and tired. Her failure to give up her seat on a Montgomery, Alabama bus sparked a year long boycott, which ended after the city agreed to total integration of the transportation system. My hope is that Rosa Parks is resting comfortably in the knowledge that she made a big difference in the lives of millions. An excellent movie detailing this turbulent time in American history is "The Long Walk Home" starring, Whoopi Goldberg, Sissy Spacek, Ving Rhames, and Erika Alexander. Nice tribute to Ms. Rosa. Also, thanks for the reminder. None of us can really afford to forget. You are right, we can't afford to forget, yet it seems so many of us have either forgotten or just didn't know to begin with. It sad that today's parents are not educating their children. We can't expect the educational system to do an adequate job. Very cool tribute to Ms. Parks. I remember seeing "The Long Walk Home" in the TV listings, but have never seen it. When it does come on again, I will make an effort to watch it. I think you would like the film. You can't really lose with Whoopi and Sissy and they were both at the top of their game. Not to say that it won't make you angry because just like most film set in that era depicting race relations, it will piss you off.